Two space station astronauts are gearing up for a planned six-and-a-half-hour spacewalk Friday to replace a presumably shorted out solar array voltage regulator that knocked one of the lab’s eight power channels out of action late last year. They also plan to finish up ongoing work to route power and data cables needed for new docking mechanisms that will be installed later. The voltage regulator, a 200-pound box known as a sequential shunt unit, or SSU, is one of eight at the base of each of the station’s solar power wings that serve to relay regulated 160-volt DC current to downstream components that then step the power down to the 124 volts used by station equipment. The SSUs also send, or shunt, excess power back to the arrays where it is dissipated as heat. The SSU in question failed last November, knocking out power channel 1B, one of the space station’s eight primary sources of electricity. Flight controllers tied systems normally powered by channel 1B to other channels, and station operation continued without any major impact. But an additional SSU failure would take down another power channel and that would force flight controllers to shut down equipment on the station, impacting research and other work, until a replacement could be installed. Friday’s spacewalk is intended to restore the lost power channel to normal operation and to restore full redundancy. “We have eight power channels, we’re down one,” said Kenny Todd, the space station operations and integration manager at the Johnson Space Center in Houston. Given the crew’s schedule in January, and with the completion of extensive training, “we think it’s probably about time to go get this work behind us,” Todd said. U.S. EVA-35 will be carried out by flight engineer Timothy Kopra and European Space Agency astronaut Timothy Peake, who were launched to the space station Dec. 15. Kopra is a veteran of a previous stay aboard the station while Peake, the second British citizen to fly in space, is making his first flight. For identification, Kopra, call sign EV-1, will be wearing a suit with red stripes and will use helmet camera No. 17. Peake, EV-2, will be wearing an unmarked suit and using helmetcam 20. The excursion is scheduled to begin at 7:55 a.m. EDT (GMT-5) Friday. The timing of the EVA is intended to ensure the actual SSU swap-out occurs in orbital darkness, when the station’s solar arrays are not generating any power. “Because we don’t know what actually caused it to fail, it could have a short inside it, so what we don’t want to do is be removing that with a potential short that could cause arcing and sparking as it comes off,” said flight director Royce Renfrew. 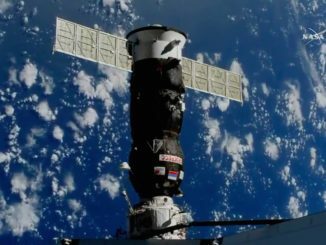 Exiting NASA’s Quest airlock near the center of the space station, Kopra and Peake, lugging the replacement SSU, will make their way to the far right end of the lab’s power truss. The truss stretches the length of a football field from end to end, meaning the SSU work site is more than 200 feet from the airlock. Once in place, Kopra and Peake will wait for the start of a 31-minute-long night pass before proceeding. Once flight controllers confirm the absence of power in the system, Kopra will unbolt the failed unit and install its replacement. The old unit will be returned to the airlock. Barring unexpected problems, the swap out is expected to take about 15 minutes. Once the work is complete, the astronauts will split up to carry out a few other lower-priority tasks. Kopra will make his way to the left side of the station and install a non-propulsive vent in the hull of the Tranquility module before loosening launch restraints on the other side of the compartment helping hold wiring to a pressurized mating adapter in place. The PMA, a sort of port extension, will be moved during a future spacewalk to the upper hatch of the forward Harmony module. Once in place, a new docking mechanism, one of two being attached to the station, will be mounted and connected to the power and data cables. 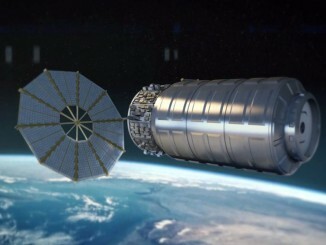 A second docking mechanism will be attached to a PMA already attached to Harmony’s forward port. The new docking adapters eventually will be used by commercial crew ferry ships being built by Boeing and SpaceX to carry astronauts to and from the space station. Initial test flights are expected in 2017. 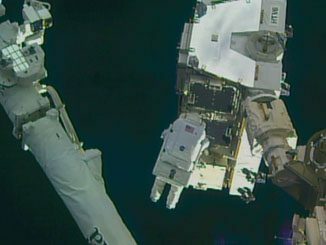 Spacewalking astronauts have been routing cables for the docking adapters over the past several EVAs and the cables Peake will route Friday are the final set. While Peake works with the cables, Kopra will retrieve a burned out light from one of the station’s truss-mounted cameras. This will be the 192nd spacewalk devoted to station assembly and maintenance since construction began in 1998, the first so far this year, the third for Kopra and the first for Peake, who will become the first British citizen to walk in space.